Continuing from my first post explaining Limited Division 3 Gun, this post on Tac-Scope Division will be more of a history lesson. 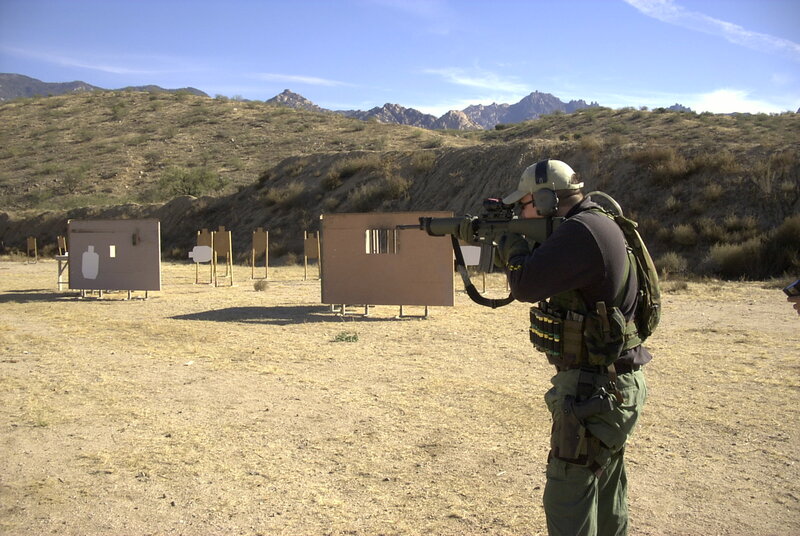 The equipment rules for Tac-Scope are otherwise the same as Limited or Tac-Irons with a single magnifying optic being allowed on the rifle in place of the 1x optic or red dot. Because they are so similar I do not see the need for the same break down of rules. The evolution of technology within the division may be interesting to people though. Author with Tac-Scope Rifle 2003. Optic is TA31F ACOG. 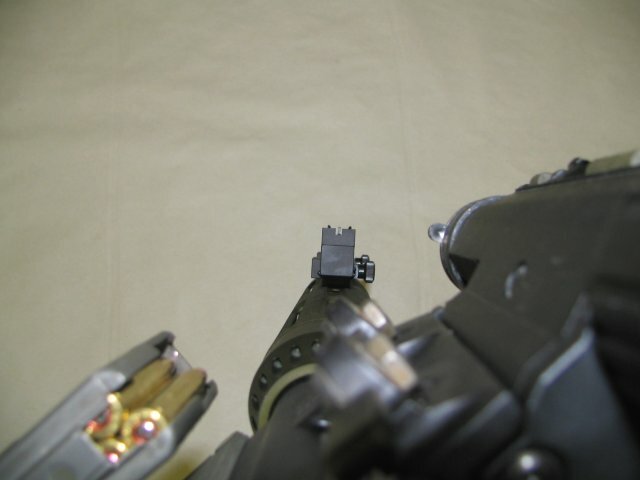 When 3 Gun first started there were only two divisions Iron Sights and Open, or in the case of SOF 3 Gun an approved military style optics list. As 3 Gun grew and became more popular so did the number of people who wanted to use a scope for long range targets but did not want to use full open division equipment. Tac-Scope division was created for people wanting to run a single optic on their rifle. Tac-Scope is currently the most popular division in 3-Gun with 50-75% of any given match participating in the division. In the late 1990s to mid 2000s ACOGS were the most popular optic in Tac-Scope. Some people used variable power scopes, but there really weren’t many suitable options. The problem with using an ACOG and in many cases the older variables is that on close range stages they were definitively slower than using iron sights or a dot. Before red dots were allowed in Limited division they could be used in Tac-Scope, but then shooters had the problem of engaging long range steel. 10-25% of the targets at most matches are long range with the rest being 50 yards or less. It was a constant technology race to find a solution that covered the diversity of target engagements reasonably well. One solution was putting a scope cap on the front of the ACOG to close off the magnified view so the shooter would only see black and the fiber optic illumination reticle. This made using the Bindon Aiming Concept of shooting with both eyes open on close range stages simpler. The support side eye sees the course and the targets, the dominant eye sees the reticle and it is super imposed in the shooters vision on the target. This is not ideal, because the shooters peripheral vision is reduced and it does cause some difference in point of aim vs point of impact that can be an issue on smaller targets or targets with less exposure. 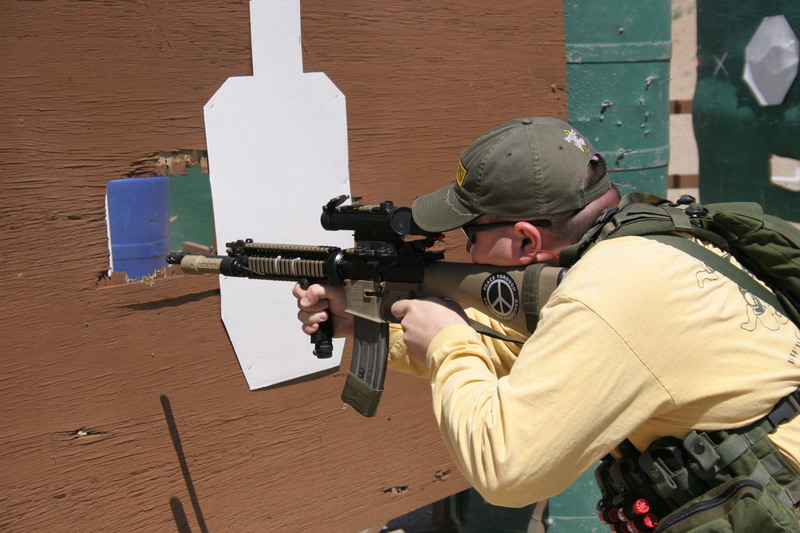 Open Division shooters would compete with magnified optics on top and an offset red dot at 30-45 degrees off center that they would use by rotating the stock in their shoulder. Tac-Scope equipment rules only mentioned being restricted to a single optic. 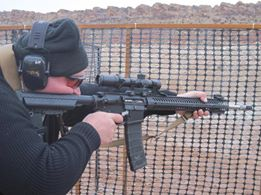 Tac-Scope shooters followed the offset red dot concept experimenting with off-set iron sights. It’s hard to say where this trend started exactly, but one of the first formal solutions was the JP Short Range Tactical sight. One of my competition rifles from 2004 with Leupold CQT and JP Short Range Tactical Sight. These were fairly commonly used in conjunction with ACOGs. Other shooters mounted Back Up Iron Sights front and rear on 45 degree angle mounts or by rotating railed free float tubes for the rail to be offset. Now there are purpose built offset iron sights from a number of companies and they are advertised for real world use in addition to competition use. Outside of match rules; using an offset red dot would be more advantageous in all ways except cost so their popularity outside of Tac-Scope division perplexes me, but I digress. 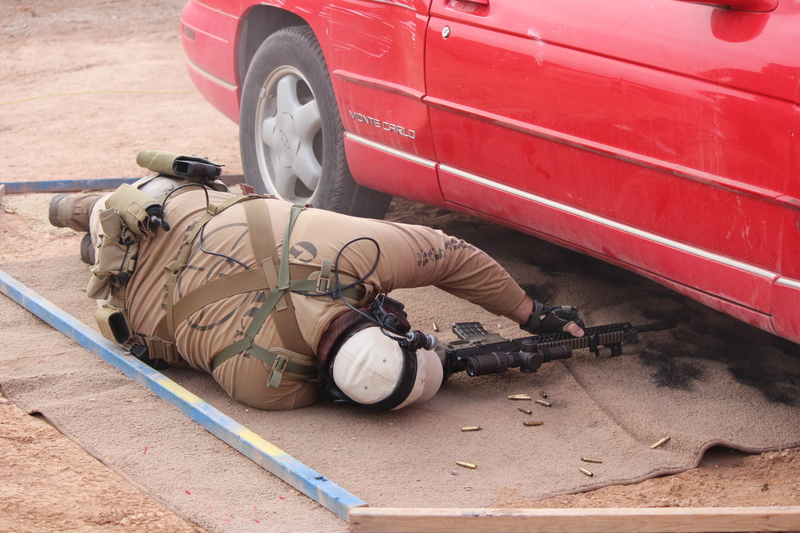 Even with modern variable power scopes some shooters still use Offset Irons in different circumstances. Jesse Tischauser’s Rifle here features the Dueck Defense sights. Jesse tells me he uses them within 15 yards if his scope is dialed up for something else at range. Note rapid adjustment lever on the scope for changing magnification fast. Aimpoint released it’s magnifier in 2006 and EOTech and others soon followed suit. Initially matches were unsure how to handle magnifiers. Some treated it as a secondary optic putting shooters using them in open, others treated it the same as using a variable power scope. Eventually the latter viewpoint won out and competitors could use red dots + magnifiers in Tac Scope so long as the magnifier stayed mounted to the gun the entire match. With the majority of targets at 50 yards or less and significantly less at 100+ yards initially Red Dots + Magnifiers seemed promising; but there were some limitations. Adding the magnifier introduced potential deviation in point of aim vs point of impact vs without the magnifier. Red dots often turned into red blobs or appeared fuzzy under magnification, lacking the precision needed on smaller targets at range. Newer magnifiers with adjustable focus have solved some of these issues. Magnifiers remain limited in their power vs dedicated variable power scopes. This is not to say you can’t be relatively successful with one in Tac-Scope (I’ve had some successes using one), you simply won’t see many shooters using them. 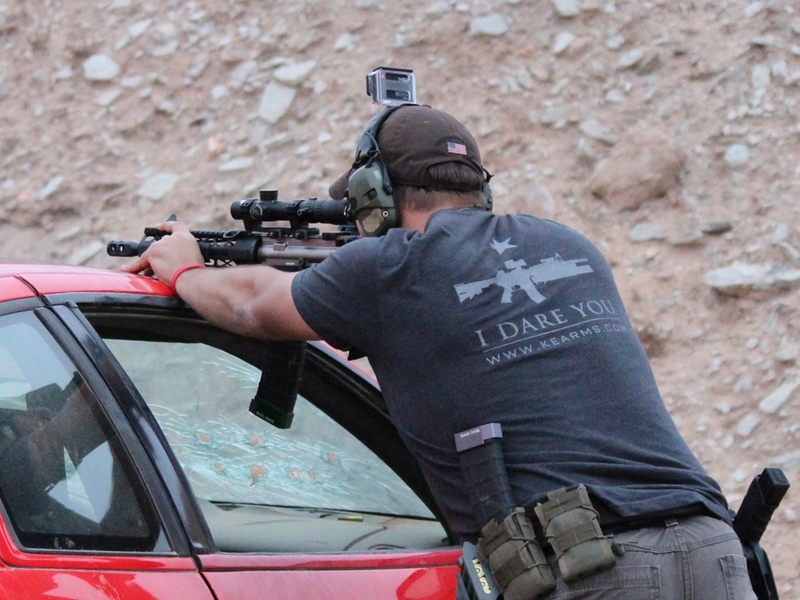 If your duty/self defense carbine is equipped with a red dot + magnifier I’d still encourage you to try it at a match. Author with Tac-Scope Rifle in 2006. Note 40 Round Steel Magazine. The Leupold CQT is a 1-3x optic, which worked fine at the time but is limited by today’s standards. It’s main liabilities are short eye relief and higher than average bore offset. Optics technology has advanced dramatically in the past 10 years. Some people credit this to the Global War on Terror, which is probably true from a funding stand point. 3 Gun is where a lot of the R&D was done in my opinion as shooters were constantly on a quest for a do everything optic to shoot from 0-500 yards reasonably well. Big advancements came in the form of reticles designed for speed up close but with BDC for .223/5.56mm. Magnification ranges got closer and closer to a true 1x. Some designs began to incorporate daylight illuminated reticles so that the scopes could function more like reflex sights on the low end. Current generation optics have wider ranges of magnification of 1-6x or even 1-8x. Arguably offset irons are of less utility than they once were unless there isn’t time to dial a scope up or down. Extended lever or arms to rapidly change magnification are commonly added to variable power scopes. 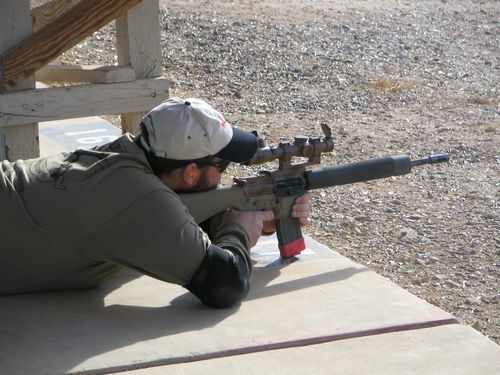 Paul Shanks with Tac-Scope Rifle 1.5-5x Leupold MKIV with SPR Reticle 2007. Note magazine monopodding. 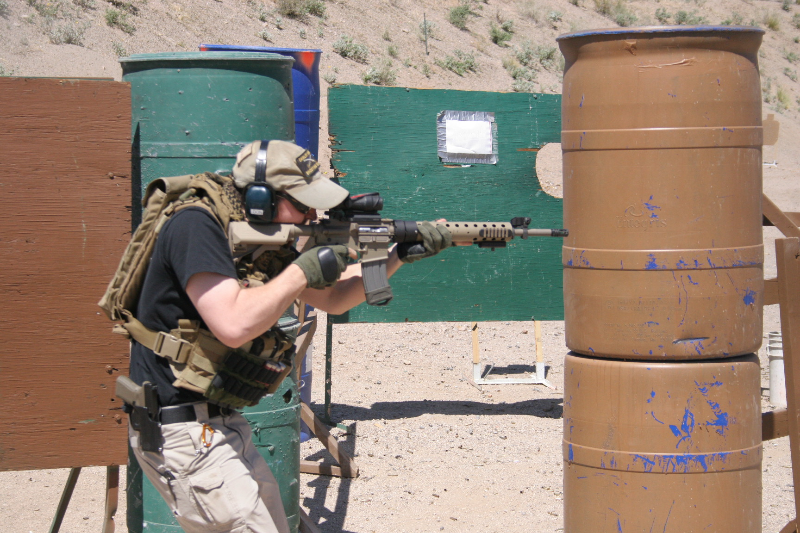 Author with Vortex Razor HD II 1-6 JM at Hard as Hell 3 Gun 2014. The long eye relief and daylight illuminated reticle makes it almost as easy to shoot from awkward positions as a red dot. I rarely compete in Tac-Scope anymore, usually opting for Limited or Open. I asked for some photos of Tac-Scope division equipment from my facebook friends. EJ Redding with his 3 Gun Rifle. You may notice while the makes, models, and details may vary all the guns have similar characteristics. 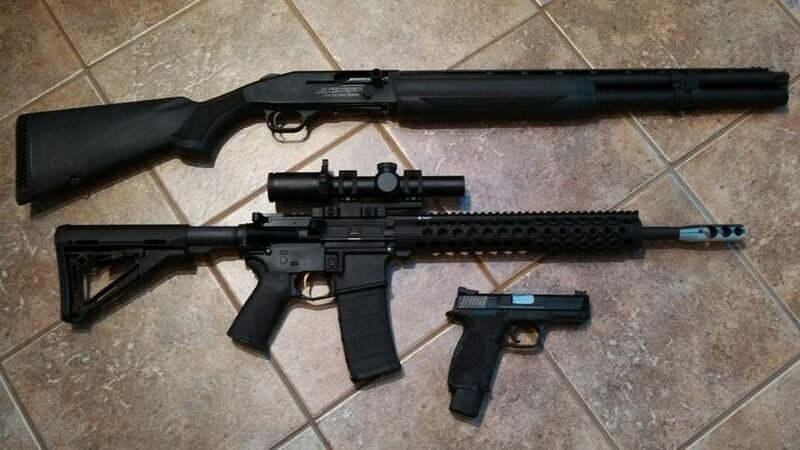 Rifles will all have a variable scope in the 1-4x to 1-8x range, free float tube, muzzle brake, and match trigger. Magazines of 40+ rounds are common to avoid reloads or minimize them. 20-30 rounders are still useful from prone positions or in confined spaces. 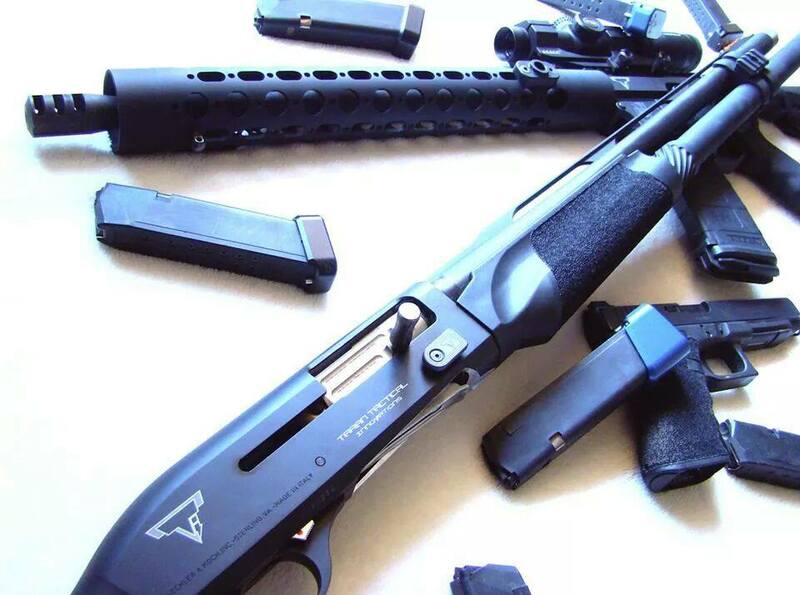 Shotguns will generally be 21-24″ barelled semi-autos with vent ribs, removable chokes, and 9+ shot capacity. Pistols will be a double stack 9mm of some kind with base plate extensions and good iron sights. Should you shoot in Tac-Scope? Competition is a lot tighter in Tac-Scope division due to the number of shooters. There is also less variation of equipment in this division. What this means is if you want to be truly competitive you are going to have to have the right gear and practice a lot harder. On the plus side from match to match across the country the rules for Tac-Scope division are the most consistent. Unless you already have the equipment or most of it to be competitive in this division, it’s probably not the place for most shooters to start. As I said before Limited is a better place for novices to start. 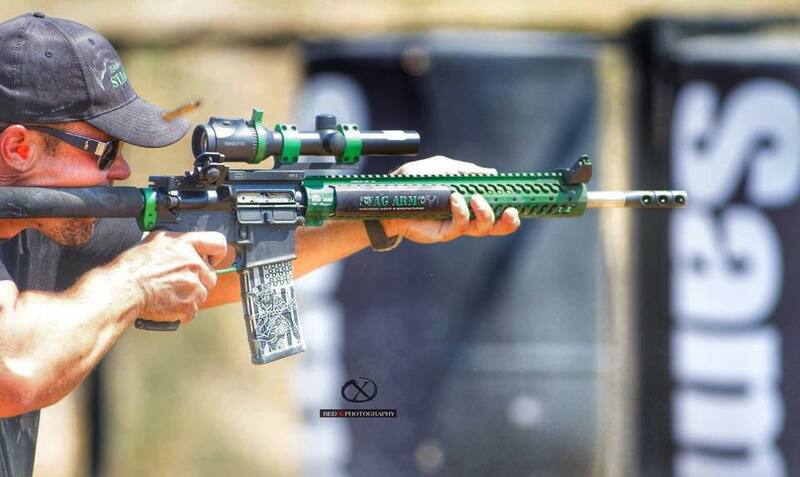 This entry was posted in 3 Gun Divisions, Competitions, Gear. Bookmark the permalink.